For more articles on the Whiteley 2 Storey please use the menu on the right. For feng shui specialist Heather Jolly and her husband, Kym, buying, renovating and selling houses has been an invigorating, creative process over the years, so change has been a constant. Have they met their match with their new, highly customised Whiteley 2-Storey home? "We left the big smoke for a sea change to the Fleurieu Peninsula almost 10 years ago and have lived in three houses since," Heather says. "After six months of looking at plans and working with architects, I saw the Whiteley 2-Storey at the Sarah Homes display village and said "Oh, my God. This is it". "I dragged Kym straight over to see it and he loved it too." While the home was perfect for the block they had bought at Encounter Bay, it was not "quite right" for Heather. She reworked the floorplan and the building materials over the next 12 months to ensure every aspect of the home addressed her strict feng shui principles. Heather's changes included redesigning the windows on the street side "to better relate to their compass direction" and making changes to the master bedroom's ensuite to allow for a biggerwalk-in wardrobe. Some other changes included utilising the family room as an entrance hall and creating a floatingwall to block the view of the stairs from the doorway, and also enlarging the downstairs bedrooms. The couple also modified the floors, laying spotted gum floorboards upstairs and modern parquetry floors in the downstairs entry hall, and the staircase, which now has spotted gum risers and sandstone paver treads. The biggest change was to the home's entry doors. The couple replaced the standard glass doors with a new frame to house two large 100-year-old Chinese elm doors. "It's my dream entrance and it looks stunning with the antique Chinese doors," Heather says. 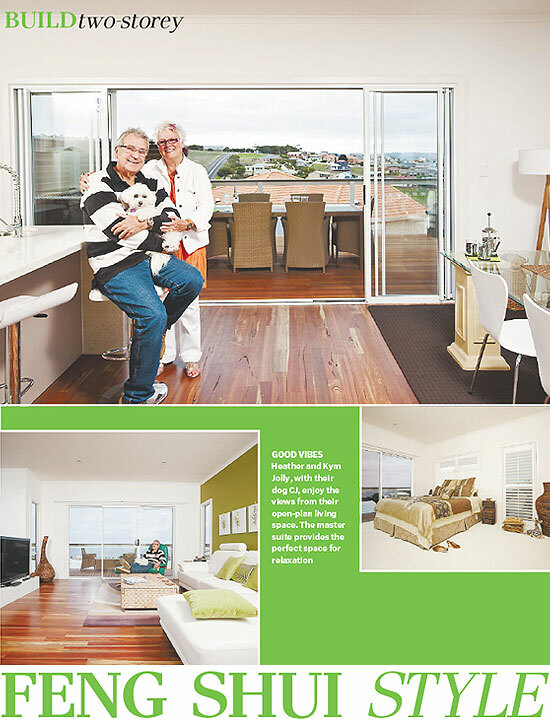 For more information about the house in this story please look at the Whiteley 2 Storey.